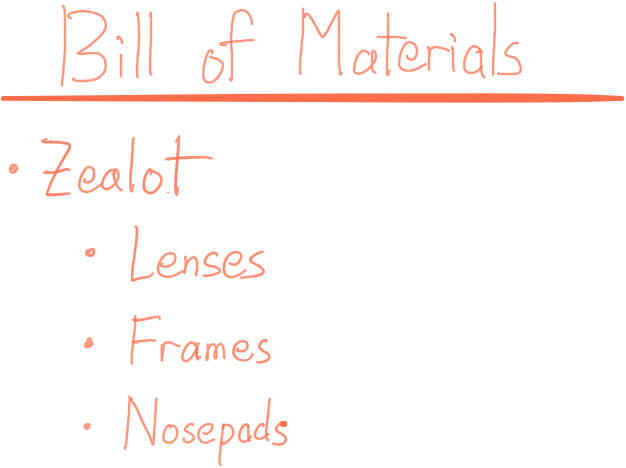 Bill of materials template: what it is and how to get started! A good Bill of Materials will help to ensure that your products are made with the same components, and with the correct ratios, each and every time. Let’s talk about what kind of details you’ll want to include in your BOM, and the different use cases for the document. Manufacturers deal with a bill of materials template on a daily or weekly basis. But even if you’re not the kind of business that assembles products, you’ll still want to get familiar with the concept. After all, if you do any kind of kits or specially priced bundles, you might use a bill of materials (BOM) to track these as well. 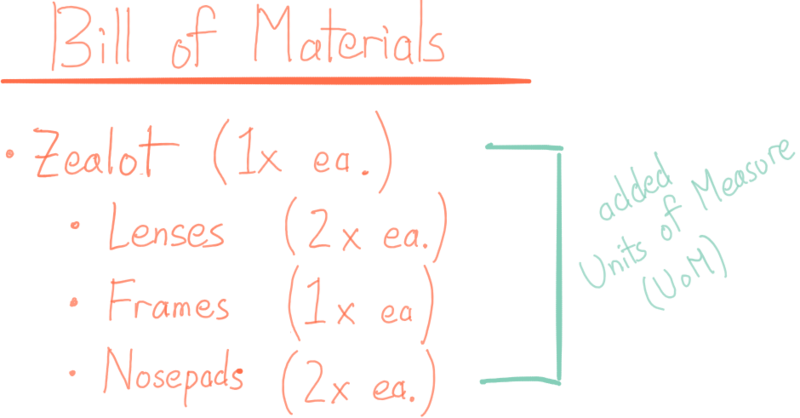 Think of a bill of materials like the ingredients list for a finished product (or finished good): the specific quantity of raw materials that are required to create one finished item. Just like the ingredients list in a good recipe, you’ll want to be very precise with your bills of materials template. Which items are listed on the BOM? Be as specific as you can about the kind of item here: “Green aluminum frames from Keystone” gives you a lot more information than “Green Frames”, since your store may sell multiple items that match that basic description. You may not personally need this level of specificity because you know your own products well, but as your business grows you may no longer be the one who actually takes action on your bill of materials, so you’re doing yourself a favour by including the right amount of information up front. You can prevent a lot of confusion and extra training down the line by including enough detail up front. These sunglasses are pretty simple, but the BOM can be a little more complex than you might think. In the case of Zealot sunglasses with optical corrections for myopia (nearsightedness), then the left lens could be different from the right lens. That’s because different corrective levels in lenses require different cuts and thickness of glass. This means that each lens could be a different item on the BOM, and the BOM for a Zealot (No Correction) would have different components than the BOM for a Zealot (with Myopic Correction). It’s important to list the kind of items that make up your finished good, but their quantity is just as important. Just like “a pinch of salt” can vary greatly depending on who is doing the pinching, you don’t want to leave the ratios in your BOM up for interpretation. Try to be specific about the unit of measure (UoM) that you use when you write your BOM by using words like “each”, “cartons”, or “crates”. You’ll also want to standardize those UoM and write out how they relate to one another. The documentation should answer questions like: how many pieces are in a single carton? How many cartons are in a crate? One of the other important functions that a BOM serves is to track cost. It’s easy enough to track cost when you’re just buying parts because you’re only accounting for the initial price and freight, but creating something out of a bunch of different items is another challenge altogether. 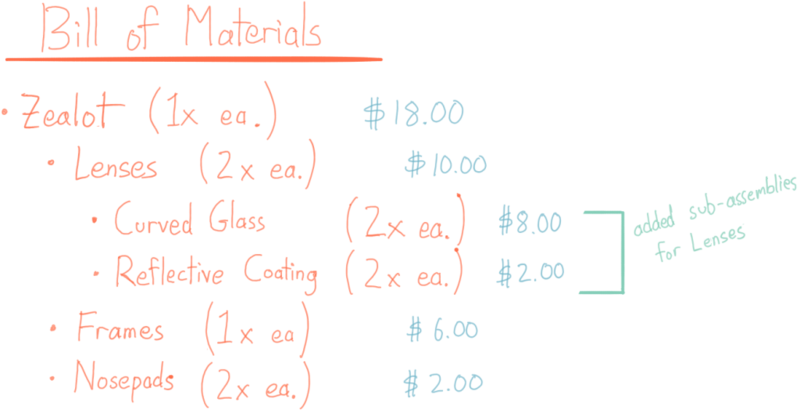 Without a good bill of materials template, it can be easy for the actual cost of your component items to get lost in the mix, and this can skew the actual cost of your end product. Since many businesses derive their price from their costs using markup, inaccurate costing could cause you to under-value the finished goods you create. When you’re putting a BOM together, make sure to track the specific costs of the items. It might also be a good idea to add a date to the BOM, since the costs of your products can change over time. As discussed earlier, even if you’re not in manufacturing, you might still create BOMs for special kits or promotional bundles. By listing all of the item details as if you were going to manufacture the finished kit, you can be sure you’ll have the right items and the right quantities present. A good BOM will also help you decide how much the final kit actually costs. What we haven’t discussed yet is where you should keep and update the BOMs for your products. Excel or Word are easy places to keep BOMs if they’re simple and relatively straightforward. In fact, we have a template for single-level BOMs to help you get started. However, once you start dealing with assembling items out of other assembled items (sub-assemblies), things can be a little harder to track. As an example, let’s talk about Archon Optical’s Zealot shades with some myopic correction. We assumed that those lenses earlier were just supplied to Archon Optical, but what if the company had to manufacture them as well? In that scenario, the BOM is suddenly multi-tiered and you have one assembly (Zealot) relying on another sub-assembly (the lenses). Handling a BOM on a dedicated document or spreadsheet can work. However, we think the faster way is to build the BOM right in with your inventory. In fact, inFlow Cloud has a built-in bill of materials template for products and also help you track your products. This makes it very easy to select any product and see if it is built out of any components. You can then view the order history for that product to see when it was last built, and how many pieces were made. If you’d like to streamline your BOM and product workflow, start your free inFlow Cloud trial today. CAN I LOOK A ELECTRICAL COMPONENT IN MY INVENTORY AND MAKE A REPORT OR PAGE IN INVENTORY THAT SHOWS ALL THE BILL OF MATERIALS THAT COMPONENT IS USED IN? I WISH TO KNOW ALL THE BOMS THAT A PARTICULAR COMPONENT IS LIST ON. how do i create bom for raw materials that are uncountable and high wastages? Good question! The BOM template we’ve laid out here is particularly for combining multiple products into a single new product. It sounds like you’d like to go the other way: to cut a larger product down into various sizes. Unfortunately this isn’t something inFLow or our template offers at this time. As a quick brainstorm, my suggestion would be to try and modify your existing “big sheet” to help you translate the raw materials into something that can show you the standard ratios of your pre-cut and cut products. You could add a column for PRIMARY (the material you cut) and PRIMARY QTY. Then create another column for SECONDARY (what you cut the material into), PLANNED SECONDARY QTY (how much you are suppose to get), and ACTUAL SECONDARY QTY (how much was actually yielded from the process). You could later divided ACTUAL by PLANNED to look at the efficiency of the process (ex. if ACTUAL yield was 80% of PLANNED, that means you have 20% waste from the process).